Arctic Circle Traverse 2013: And so... Kangerlussuaq! Almost 19:00 here at the moment and its probably a good time for a couple of beers! One year later, after last year's SPLAZ campaign (Snow Processes in the Lower Accumulation Zone), we set our feet once again back in the cold and white Kanger. Horst, Dirk, Mark and myself (Babis) arrived at around 2pm local time. We are waiting for Mike to arrive from the U.S. with the last flight for today in approximately one hour from now. With him here, we complete the group of people that participated also in last year's expedition (Dirk, Horst, Mike, Babis). 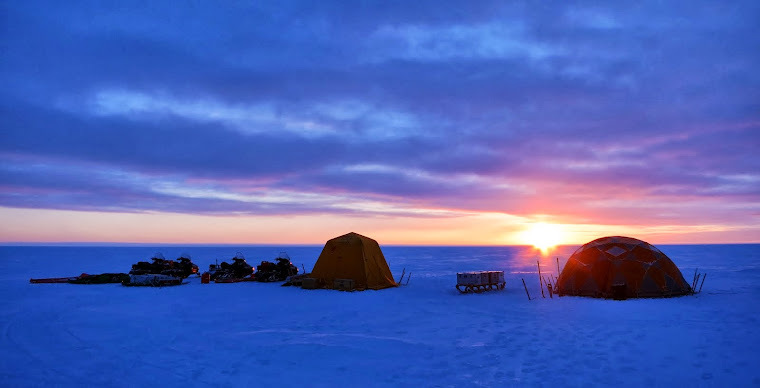 I guess it is nice to blog a bit now that we have ourselves the opportunity to do so, since after Tuesday, when we will be on the ice sheet, we will text stuff once per day and Jason will do that for us. First thing we did upon arrival was to settle down at the KISS facility (Kangerlussuaq International Science Support). We met Kathy from KISS who has already taken care of a lot of stuff for us and has provided us with a briefing and also plan Bs (sometimes even plan Cs) for yet unsettled things like our scooter overalls still stuck at some post office somewhere in Copenhagen. Pleasant surprise and a great assistance! We got a truck so we can move around, located our cargo that arrived here last week and started checking out things in the preparation checklist, trivial but vital parts for our expedition. Me and Horst checked if all the tends were complete and robust, while Dirk sorted out the food from last year that can still be used. Kind of boring tasks, but we had also some fun checking our steam drill. I had never used that before and its quite nice the feeling of drilling through thick ice like butter! I guess the biggest challenge for tomorrow, besides the inspection of the whole equipment, will be... shopping! Five guys in a supermarket trying to pile up food for a month... Right. I am so glad last year Faezeh took care of all the shopping with accurate and precise (Ninja!) moves in the shopping center here in just half an hour. I can totally see the five of us tomorrow starring at the pasta for 20 minutes unable to decide whether we should get spaghetti or penne. That's it for now, I think. My beer is probably getting warm and I should get back to it! Besides, photos are a bit more interesting than my blabbering and this will happen later by Horst who used quite a bit - even in this first day - his notorious Ice-Ice-Leica! Cheers!